Flickr Pool: Three-Foot Duct Tape Roll Are You Smarter Than A Bolt? If you really need to know the pitch of a screw or bolt, a screw pitch gauge is probably the quickest and most accurate way to check. There’s no trying to thread into hole after hole in a plate — you just find the leaf with the teeth that match the screw threads, and read the marked pitch. 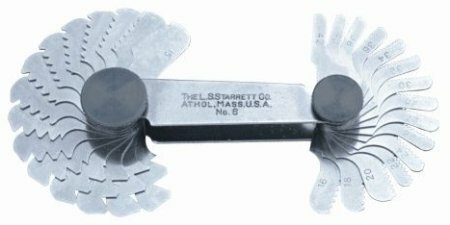 The Starrett 6 screw pitch gauge covers most common pitches you’ll run into. The substantial steel case houses thirty leaves with American National 60° threads ranging from 4 to 42 threads per inch. Starrett designed the narrow leaves to also fit internal threads, and a locking device at both ends of the gauge secures the leaves while in use. Expect to pay about $30 for the Starrett 6 screw pitch gauge. Thanks and looking forward to receive your proposal.